Nice brakes. Did the driver have any comments on them? No he didn't but I never asked about them specifically. They sure were unusual looking. But they sure were big! Last edited by bcseitz; 05-13-2008 at 08:00 PM. But you know what?.... The driver actually asked us what we thought of the hood! So I can't help but wonder if they are getting mixed feelings or negative comments from the outside about the window in the hood??? Personally I would rather see a heat extractor style hood on there. Maybe something like the MCM hood or even something more radical like the C6R hood. Now that would be cool! Last edited by bcseitz; 04-19-2008 at 10:34 PM. I saw what I believe was a new ZR1 yesterday on Litchfield Rd. in Goodyear, AZ (about 20 miles west of Phoenix). We were going opposite directions but the car really stood out. At first I thought it was a ZO6 but the hood was different and the body seemed a lot wider. This one was a medium gray color. I couldn't go back to check it out though. Anyone else see a gray one in the Phoenix area? 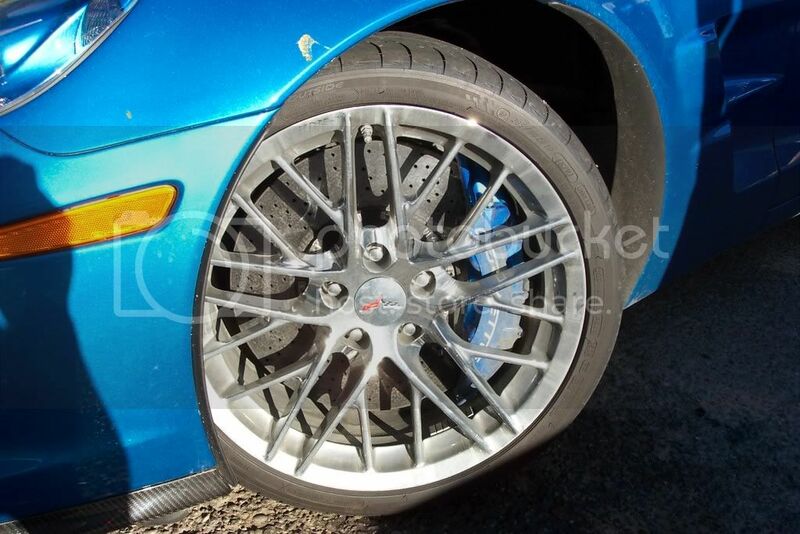 I seen the same blue ZR1 at the Scottsdale Pavilions Saturday night. I'm surprised no one has noticed that the Carbon Fiber skirts on the sides are missing. Don't worry though, I asked the guy and he said they left them off for transporting purposes and didn't get around to putting them back on. Yeah, he told us the same thing about the lower skirts. I'll bet some of the rough roads they drive on would get them all bashed up anyway! Kinda like those rough dirt roads they ran the C5 test mule cars on as shown in the book "All Corvettes are Red". No he didn't but I never asked about them specifically. They sure were unusual looking. No drilled holes, no slots, nothing. But they sure were big! Huh?, what do you mean "no drilled holes"? I see plenty of holes in those carbon brake discs.